The search will only return results, when the whole word matches, therefore you can't search for substrings. Unfortunately punctuation marks are handled as part of the word. 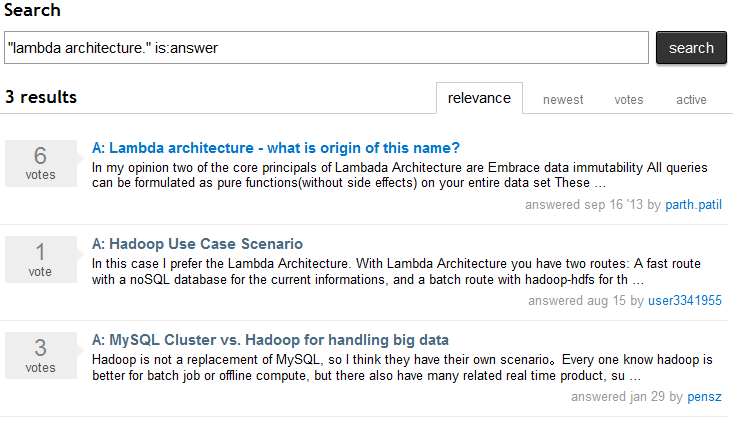 Searching "lambda architecture" is:answer will return 2 results. Searching "lambda architecture." is:answer will return 3 results. Note that only one result is returned by both searches. You'll also get other results when searching with a colon at the end. Please ignore punctuation marks in posts on search, so that I'll see at least 4 answers with both searches. If I search explicitly for a special character such results should be more relevant and therefore at the top. Browse other questions tagged bug status-completed search .